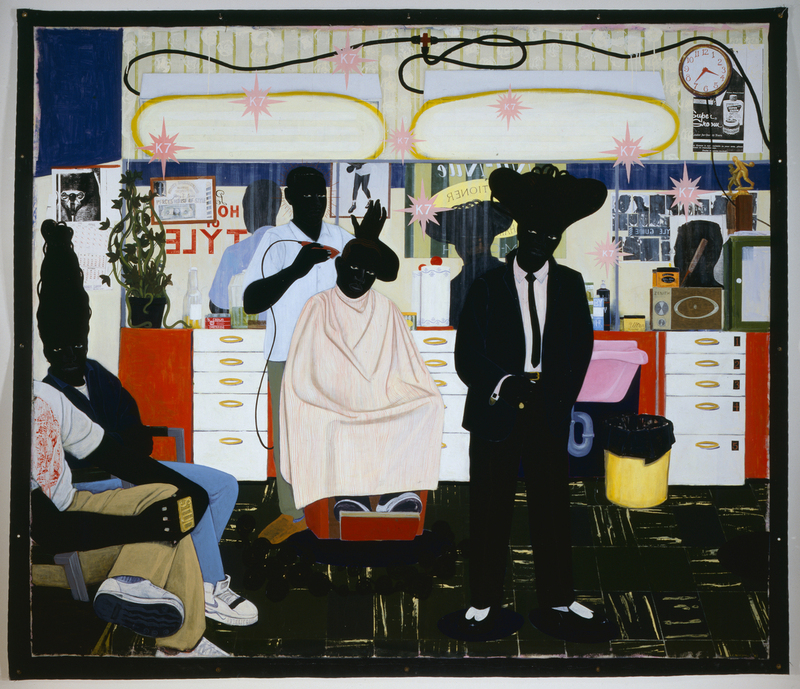 Kerry James Marshall: A Black Presence In The Art World Is 'Not Negotiable' For decades, the 61-year-old artist has depicted black lives on canvas. He says inclusion in museums must not be contingent on "whether somebody likes you ... or somebody's being generous to you." With his large-scale, exuberant paintings, artist Kerry James Marshall is on a mission: to make the presence of black people and black culture in the art world "indispensable" and "undeniable." Now 61, Marshall was a young artist when he decided to paint exclusively black figures. "One of the reasons I paint black people is because I am a black person ..." he says. "There are fewer representations of black figures in the historical record ..."
Marshall was born in Birmingham, Ala., in 1955, just before the Montgomery Bus Boycott began. He grew up in South Central, Los Angeles, and was living in the Watts neighborhood in 1965, when riots broke out in protest of police brutality. "The hope was always to make sure these works found their way into museums so they could exist alongside everything else that people go into museums to look at," Marshall says. And it's worked — a 35-year retrospective of his work has appeared at New York's Metropolitan Museum of Art, Chicago's Museum of Contemporary Art, and now, the Museum of Contemporary Art in Los Angeles. His paintings depict daily life — people planting gardens, picnicking and getting haircuts. Helen Molesworth, curator of the Museum of Contemporary Art exhibit, points out Marshall's 1993 work, De Style. "I consider this to be Kerry's first great painting," she says. It's a massive canvas that shows a scene in a barbershop. 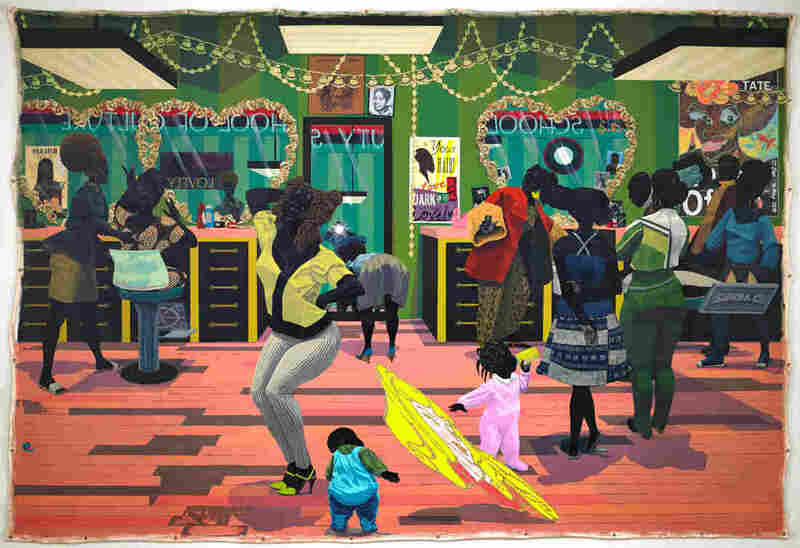 "He's going to give you an image of blackness, of African-American culture, of daily life that is both rooted in everyday pleasures, but also transcendent at the same time," Molesworth says. Molesworth's favorite painting, School of Beauty, School of Culture is monumental. It bursts with riotous colors and spirited life. The work shows women's space — little kids play as ladies pose and primp. "One of the things that these pictures show us over and over again is that the category of beauty is really large," Molesworth says. "If whiteness is the only form of beauty you see, you are operating in a pretty small universe." People can get emotional in front of these paintings. 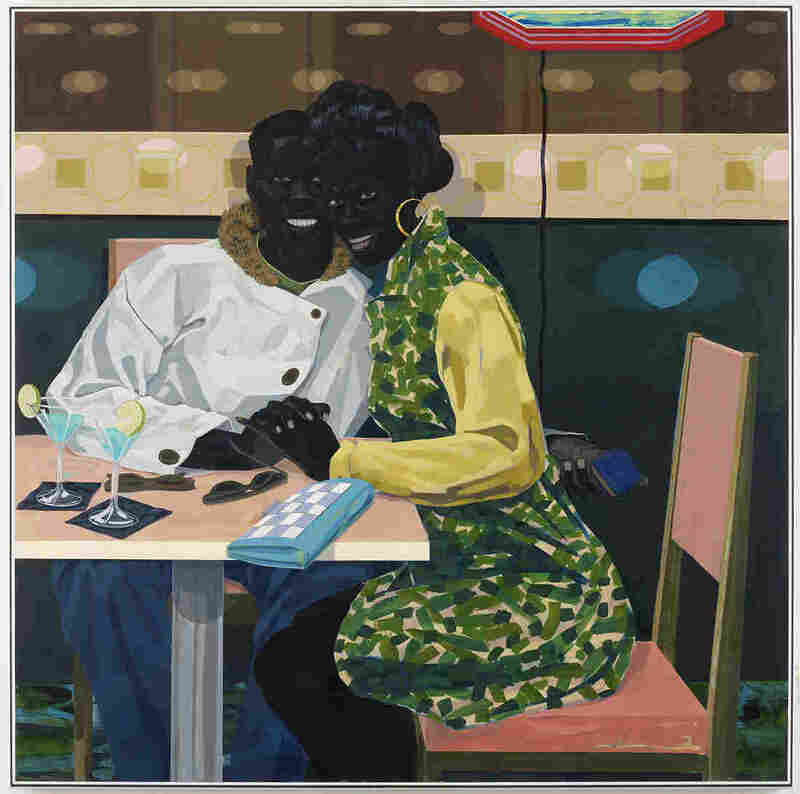 "I've seen people kiss in front of Kerry James Marshall paintings ..." Molesworth says. "These paintings are emotional — they are filled with love." It's not all happiness on these walls, though — there are funerals, killers, lost boys, anger and grief — but always depicted in bright, bold colors and powerful shapes. Marshall's 1994 "Garden Project" series shows the early, utopian days of public housing in Chicago and Los Angeles. Lovers stroll along groomed lawns, men rake and plant flowers, children ride bikes and run dogs. Marshall's 1994 "Garden Project" series shows the early, utopian days of public housing in Chicago and Los Angeles. 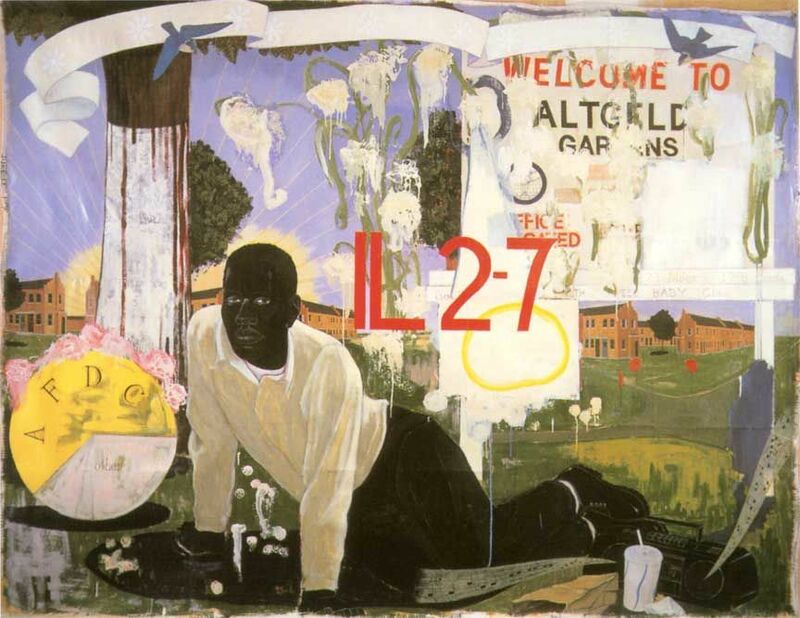 "There's kind of a mixed message and it has everything to do with what people expect in a painting that's about housing projects," Marshall says. In one, a man sits on one hip, leaning forward on the grass, supported by extended arms. He stares directly at us — very seriously. Behind him, white paint blots a big sign that says Welcome to Altgeld Gardens. Click here to get a closer look at the painting. Some might perceive desperation in his eyes — but not the artist. "I know better," says Marshall, who has lived in public housing. "I know it's not so despairing. ... When I look at his demeanor, I see contentment. That's what I see. The gaze out at the spectator, there's a certain uncertainty about the way he sees himself being perceived by the spectator." These are not romanticized images; they are vivid, energetic, real-life reports — and Marshall wants those reports on museums walls. His works have sold at auction for $1 million and $2 million. And his paintings are part of the permanent collections of the Met, the National Gallery, the Museum of Fine Arts Boston and more. "What you're trying to create is a certain kind of an indispensable presence," Marshall says. "Where your position in the narrative is not contingent on whether somebody likes you, or somebody knows you, or somebody's a friend, or somebody's being generous to you. But you want a presence in the narrative that's not negotiable, that's undeniable."